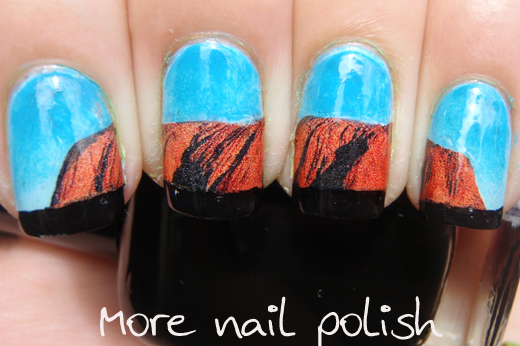 Let me tell you folks, this is so much fun doing Aussie themed nail art. I usually find it really hard to come up with ideas for nail art, but having a theme really makes it so easy. I've got so many ideas and not enough days to fit them in. Anyway today's nails are something a little different for me. 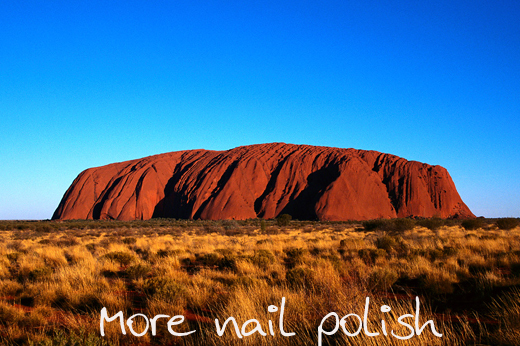 I've gone with a panorama shot of the beautiful Uluru or Ayres Rock in Central Australia. Here's my inspiration for the nails. 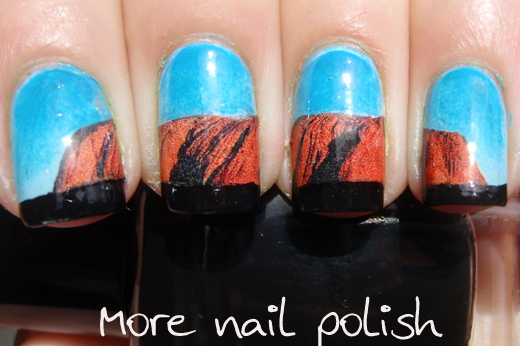 I actually used the above photo and printed the rock onto water decal paper, then cut it and placed on my nails. I used Ulta3 Spring Shower as the base, sponged with Ulta3 Blue Heaven. I then painted a black french tip and put the water decals on. So what do you think? 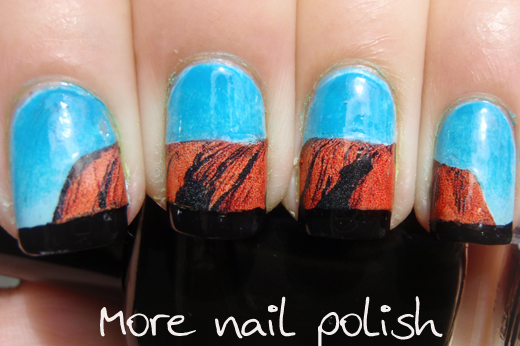 Does it look like Uluru to you? Maybe if you cross your eyes a little and treat it like one of the magic eye pictures? The only frustrating thing about doing a panoramic scene on your nails is that you have to hold your nail just right to show people, otherwise it looks like nothing! OMG! 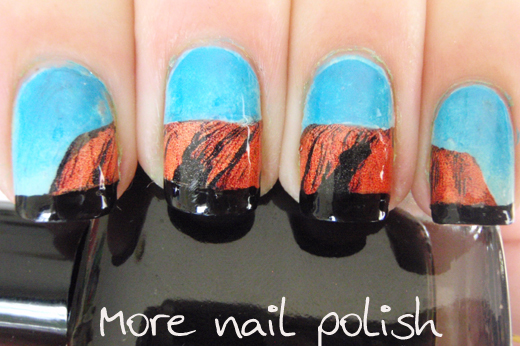 That's nail art masterpiece! OMG! That is amazing! I actually started halfway down the post and immediately went "Is that Uluru?". Impressively done! Thats so cool! I'm super impressed! Oh, oh I wonder where I can get it? Kmart, Priceline, Target? Thanks girls, I grabbed a bottle today! Priceline, but mine was $7.95. WOW! Spectacular - very creative work. This is beyond awesome with all the nails lined up! OHHHH MY GOD! That is insane! That is the best idea ever!!! Where does one buy said paper? ebay - search "water slide paper"
Many thanks - and here I was excited over printable shrinky dink paper! That is so clever! It definitely looks like Uluru. My favourite Aussie mani so far. Yes, I was trying to decide which to do between the bridge and the rock. I thought there were more bridges around the world now that are similar to the SHB, so I went with the rock cause its one of a kind. I would love to know where you buy your decal paper from, it looks soooo cool! I got my paper from ebay, just search "water slide paper"